Alchimie Forever Kantic Calming Cream 1.7 oz. 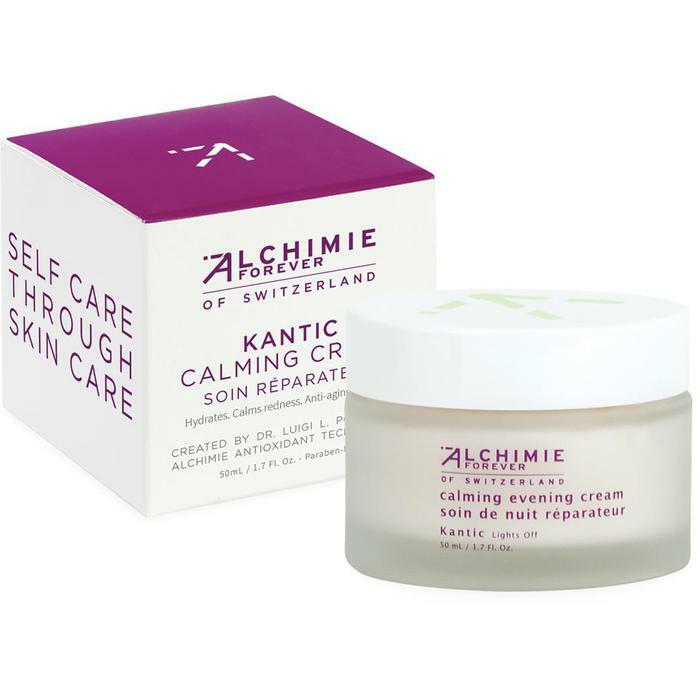 Alchimie Forever Kantic Calming Cream / 1.7 oz. Kantic Calming Cream - Miraculous. Multi-purpose. Visible results. The original cream. Rich in natural antioxidants derived from blueberries and grape seeds, this midweight cream hydrates, reduces redness, revives dull skin, and helps minimize the signs of stress and fatigue leaving the skin youthful and radiant. Formulated in Switzerland. Blueberries (anthocyans, quercetin, resveratrol), jojoba, grape seeds (anthocyanidins, catechin, quercetin, resveratrol), vitamin E.
Best for normal to dry skin types. Ideal for sensitive or sensitized skin. Smooth over cleansed face and neck twice daily. Best for normal to dry skin types. Ideal for sensitive or sensitized skin. Non comedogenic. Apply two weeks after laser resurfacing treatment. Apply after photo-rejuvenation treatment. Apply after anti-redness treatment. Apply after photo-facial treatment. Water/Aqua, Cetearyl Ehtylhexanoate, C14-22 Alcohol, Glycerin, Simmondsia Chinensis (Jojoba) Seed Oil, Hydroxyethyl Acrylate/Sodium Acryloyldimethyl Taurate Copolymer, Tocopheryl Acetate, Myristyl Lactate, Vaccinium Myrtillus (Bilberry) Fruit Extract, Vitis Vinifera (Grape) Seed Extract, C12-20 Alkyl Glucoside, Squalane, Polysorbate 60, Chlorphenesin, Benyzl Alcohol, Benzoic Acid, Sorbic Acid, Fragrance/Parfum, Hexyl Cinnamal, Alpha Isomethyl Ionone, Amyl Cinnamal, Linalool, Butylphenyl Methylpropional, Citronellol, Limonene, Hydroxycitronellal.